Dacor Refrigerator Repair | Call Now! (206) 504-1684 We Repair: Dacor Refrigerator, Freezer & Ice Maker. Dacor refrigerators are just one of the many appliances we repair. If you need Dacor refrigerator repair for any model, an ice maker or a freezer, we’ll respond quickly to get your food preservation appliance running properly again. It’s not just Dacor refrigerators that we fix. 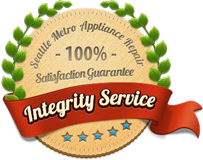 Our expert technicians offer Seattle appliance repair for all major brands and all major home appliances. Call us when you need a repair to your refrigerator, freezer, dishwasher, range, stove, oven, cooktop, rangetop, compactor, clothes washer or clothes dryer.